Oregon State is hoping to finally realize the promise of its 2015 recruiting class that featured Tres Tinkle, Stephen Thompson Jr., and Drew Eubanks. All three are healthy going into this season. Tinkle, a 6-foot-8 forward, was sidelined for much of last season with a wrist injury, one of a series of unfortunate events to befall the Beavers. Oregon State finished 5-27 and at the bottom of the Pac-12 with just one conference win. 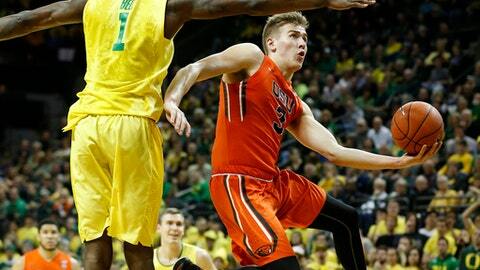 Tres Tinkle, the coach’s son, broke his right wrist in the sixth game of the season. He was averaging 20.2 points, 8.3 rebounds and 2.3 assists. He was granted a medical hardship and will play this season as a redshirt sophomore. Oregon State’s lone conference win came at home against Utah, 68-67, on Feb. 19. The Beavers were the 12th seed going into the Pac-12 tournament and fell in the opening game to California. Eubanks , a 6-foot-10 forward, started in all 32 games last season, averaging 14.5 points, 8.3 rebounds, 1.2 assists and 2.2 blocks per game. Thompson averaged 16.3 points, 4.3 rebounds and three assists, while making 57 3-pointers. The Beavers return 10 players, including the starters for most of last season: Thompson, Eubanks, JaQuori McLaughlin, Kendal Manuel and Gligorije Rakocevic. Oregon State added six newcomers, including forward Seth Berger, a graduate transfer from UMass, and Ethan Thompson, Stephen’s little brother. FAMILY AFFAIR: The Thompson brothers are the sons of Oregon State assistant Stephen Thompson, who was the head coach at CSU Los Angeles for nine years before coming to Corvallis with Wayne Tinkle’s staff in 2014. INCOMING THOMPSON: Ethan Thompson is a four-star shooting guard out of Bishop Montgomery in Torrance, California, where he averaged 22.8 points, 7.7 rebounds, and 5.4 assists as a senior. Wayne Tinkle said the youngest Thompson emerged in advance of the team’s exhibition trip abroad this summer. KONE OUT: The Beavers will be without sophomore forward Ben Kone until at least mid-November after a minor procedure on his left knee. Last year as a freshman he averaged 2.9 points and 2.7 rebounds in 23 games. Also, the Beavers haven’t gotten medical clearance for center Cheikh N’diaye, who played the first nine games of last season before a left shoulder injury sidelined him the rest of the way. He averaged 3.6 points and 2.2 rebounds. N’diaye also received a medical hardship. BARCELONA: The Beavers were staying in a hotel in Barcelona, Spain, near where a terrorist drove a van into pedestrians, killing 14 people. The team was having a pregame dinner when the attack occurred, and players could see some of the scene through the windows. The group thought about going home, but the logistics were difficult, Wayne Tinkle said later. ”We had to stay together as a group,” he said. They went on to win all four exhibition games they played. ”I think we all learned a lot about ourselves, and we left a little bit of ourselves behind,” he said. OUTLOOK: The Beavers were picked to finish eighth in the Pac-12 in the preseason media poll.